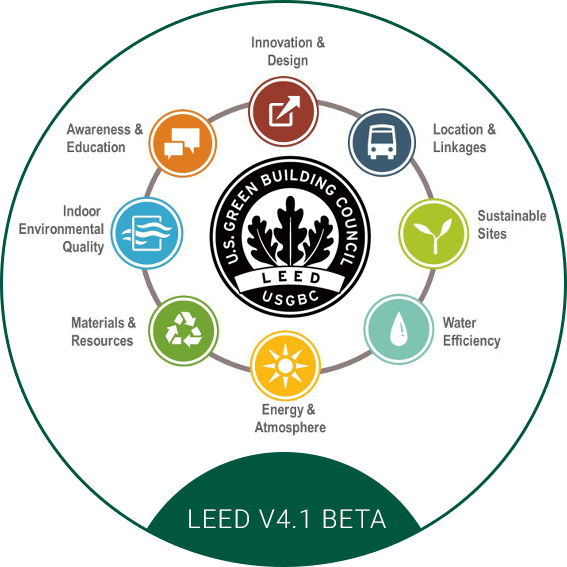 The US Green Building council has announced recently the release of LEED V4.1. This release will not be a full version change, but rather an incremental update to the LEED rating systems. The current release of the Beta version only focused on LEED O+M projects. According to the USGBC this new version of LEED promises to be more inclusive for all O+M projects. It will do so by allowing projects to earn points via the online ARC platform. LEED V4.1 will also drive performance outcomes by measuring a building’s performance on an ongoing basis. LEED V4.1 promises to bring now methodologies to the credit process. Instead of uploading a lot of documentation to the LEED software platform LEEDonline, data will be reported on line using metrics to track the project’s energy, water, waste, transportation and indoor environmental quality performance. LEED V4.1 contains updated referenced standards and performance requirements to ensure that the LEED system remains the global leader in green building. LEED v4.1 gives more weight to credit requirements that are directly measurable by the project. 90 of the total points are allocated to the prerequisites that have a calculated performance score, based on actual building data. A LEED v4.1 O+M beta certification is based on the performance of the project space for a specific 1 year time period (365 consecutive days). The project’s performance data is collected on a rolling basis throughout the year, with the “current score” displayed based on the most recent 365 days. The performance is calculated based on the project’s basic data; Weekly operating hours, Number of regular occupants and part time employees, number of visitors and their duration of visit. Transportation performance (Prerequisite). This credit was changed to a prerequisite. A transportation survey is mandatory and is conducted using an online platform provided by USGBC. Options 2 and 3 have been removed. A transportation performance score is generated based on the provided survey results on the basis of carbon emissions. Rainwater Management: Only minor changes to credit. Compliance is based on roof, parking, and nonroof areas combined. Credit language has been revised to address the existing building context. Added mandatory site assessment to identify natural areas providing habitat. Credit is based on practices used versus performance goals from a site policy. Added requirements for organic mulch and vegetation irrigation. Removed performance requirements for limited turf area, all manual or electric powered equipment, reduction in emissions from site management equipment and the need to protect or restore habitat. Projects have installed water meters that measure the total potable water use for the project and associated grounds. All potable or reclaimed water supplied to the project must be metered. 12 months of data is inputted online to calculate a water performance score for the project. Energy meters required for monitoring ongoing energy use. The energy is measured on a 12 month basis and inputted into a LEED score calculator. A performance score is generated based on 2 metrics: greenhouse gas emissions and source energy. Solid Waste Management-Facility Management and Renovation. Removed requirements for solid waste management policy. Requirements for storage locations for recyclable materials and batteries and lamps moved to new prerequisite. Simplified ongoing consumables paper, toner cartridges, binders, and desk accessories to office supplies. Removed Food and retail requirements for environmentally responsible sourcing of retail merchandise. Requirement added to separate facility maintenance and renovation waste from ongoing waste. Online loading of data required. A performance score of 40 is needed based on the online reporting system. Waste tracked by weight only. 50% ongoing waste and 75% durable goods waste thresholds have been removed and replaced with a waste performance score. A combination of purchasing credits from LEED V 4.0. Added Points for Interior projects. Compliance may demonstrated with a minimum of 1 month compliance. Credits Purchasing Ongoing, Lamps, and Purchasing- Facility Management and Renovation moved into this credit. Prerequisite: Minimum Indoor Air Quality Performance renamed to Minimum Indoor Air Quality. Updated referenced standard from 62.1-2010 to 62.1-2016. Revised outdoor air requirements for mechanically ventilated spaces and for minimum opening and size requirements for naturally ventilated spaces. Exterior Signage requirement has been removed. A requirement to communicate the no-smoking policy to occupants and have in place provisions for enforcement has replaced it. Option 2: Auditing Requirement Deleted. Cleaning Service must be in good standing. Enhanced Indoor Air Quality Strategies. Prerequisite & credit: Indoor Environmental Quality Performance – New. Occupant survey and Air testing data is input into online USGBC calculator for performance score. Score must exceed 40 to pass. Credit is a combination of Green Cleaning- Custodial Effectiveness Assessment, Green Cleaning- Products and Materials, Green Cleaning-Equipment. Renamed Green cleaning- equipment to Powered janitorial equipment. The requirement for a phase out plan has been removed. Cleaning products and materials – Tracking purchases it is not required: Compliance may now be demonstrated with a product inventory or from total annual purchases. Integrated Pest Management: Minor changes for clarification. LEED AP now required for projects. Credit Options updated – project teams can choose to pursue one eligible innovation strategy or pilot credit to achieve the point. Exemplary Performance has been removed. Regional Priority – Removed credits. LEED v4.1 O+M is available for use, now, in beta form that will run concurrently with an approval process that will include public comment and a balloting of the members in 2019. It is unique for USGBC that initially, v4 and v4.1 will both exist on parallel tracts at least until the vote by the members. LEED v4.1 versions of other LEED rating systems, such as BD+C, will be coming out later this year. This is a significant change for the LEED system as it moves to automate things more, use real data for reporting a project’s sustainability, and reduce the documentation for certification. It should be a useful update to draw in more projects and lead to a greater number of certifications.